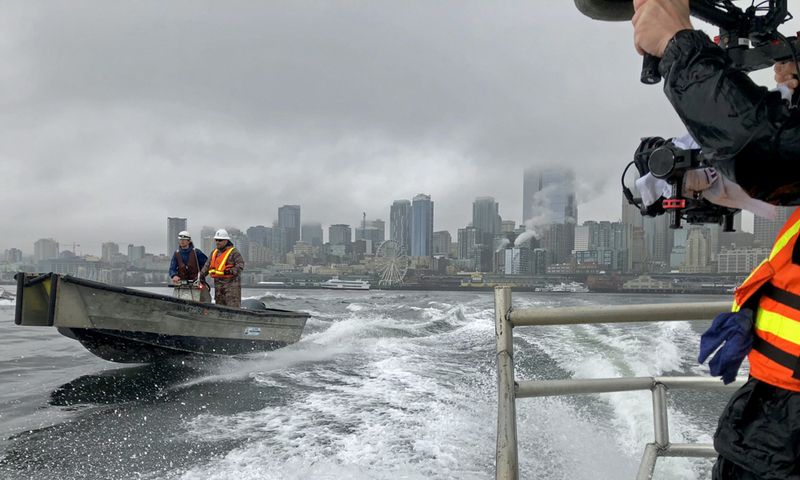 Their name is Global Diving & Salvage, but the reality is the Seattle-based company does much more than just diving and salvage. 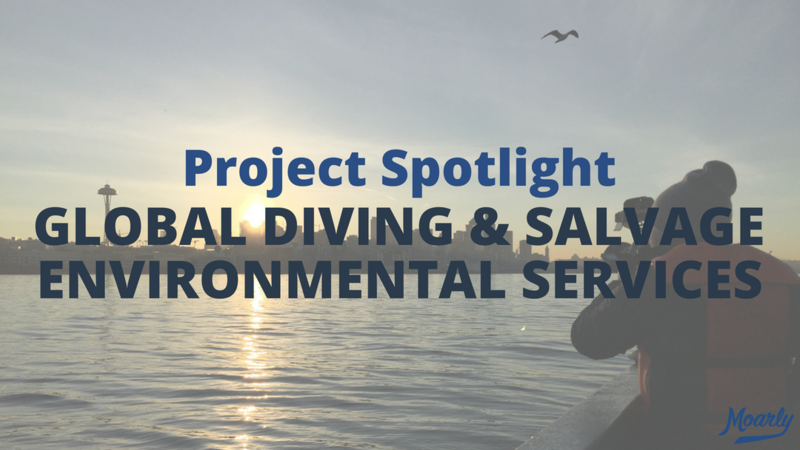 Among their many service lines, Global also provides top-notch environmental services. Those environmental services were the focus of a recent video shoot with Global. It was our task to highlight the environmental technicians (“enviro techs” for short) and the preventative oil booming services they do. We had worked with Global’s environmental technicians in the past (watch the video here), but this was the first time we got hands on with them. 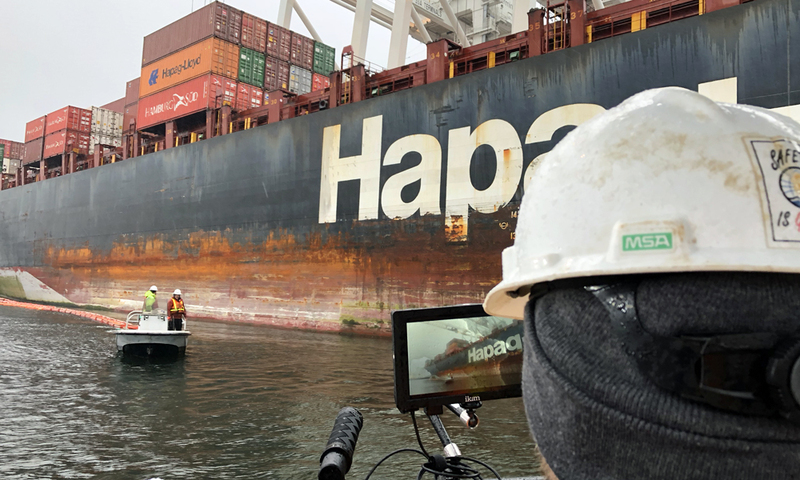 We spent two days on the water with the environmental crews, watching them work on a salvage near Blake Island and also conducting booming operations at the Port of Seattle and other locations nearby. Two things really stand out about Global’s environmental technicians: they work extremely hard (up to 80 hours or more a week) and they really care about what they do. They take the “environment” part of their job seriously, and they’re darn good at it. In our video, we showcase their grind and passion. One of the most important jobs the environmental technicians take care of is daily booming. The whole idea is to prevent oil spills from contaminating local waters. Global is out there every day – no matter what the conditions are. That includes the pouring rain, like the shoot day we spent with them for the booming story. It wasn’t just wet, either. It was also cold. I had to sign paperwork after our shoot and I could hardly hold the pen because my fingers were numb. We were out there for a single shift with the enviro techs, and my body was struggling to operate properly. But these guys are out in the elements every single day. The level of respect I have for them is tremendous. That’s one of the best parts about working in video production; experiencing things you wouldn’t have the opportunity to experience otherwise. My appreciation for the maritime industry continues to grow with every video shoot we do with Global Diving & Salvage. We can’t wait to see where the work takes us next! Rain, hail, sunshine or snow, we’re the video production team to partner with in Seattle (or anywhere else around the world). Just ask Global Diving & Salvage! Please feel free to contact us and/or connect with Moarly Creative on Twitter, Facebook, Instagram, and Vimeo. You can also learn more about Global’s environmental services by clicking here. For nearly twenty years I had the opportunity to be associated with Global Diving and Salvage as a Tankerman PIC reservist. Global maintains a group of maritime professionals who are at the ready if an environmental incident occurs. Fortunately, I was never needed for a real event, but I took place in their frequent spill and emergency training drills. Global is a company of good people with high standards. Thanks for sharing your experience with Global, Rick. And thank you for being at the ready if anything did happen!